I recently had a colleague ask me "why should I learn this tech stuff. How will it help me or my students?" I answered that it could make him moreefficient and organized, able to learn new things, and allow his students to do new things, explore, engage, create, and have fun learning.We talked for a few more minutes and I convinced him to come to a professional development session I was running entitled "An Introduction to Educational Technology" where I introduce some basic edtech tools and resources and show the participantshow to get started using educational technology. Many teachers are intimidated by everything out there, so I also point themtowards resources that can help them overcome their fearsand learn to use the resources. The conversation got me thinking more about the value of educational technology. I have always believed in edtech as a valuable educational tool and resource, but I wanted to try to verbalize my beliefs better and come up with concrete examples. So, here goes. I was trying to figure out how much money I have saved in my classroom alone by utilizing educational technology in place of other things. I could not put a numeric value on educational technology. I know I save money, I know I save time, I know I offer my students labs and experiences that I couldn't otherwise (due to budget issues), I know the students have fun, I know that they are creating instead of just consuming, I know I am more efficient and more organized, I know I learn a lot from my PLN, I know my students learn a lot from the class and their work. How do you put a price on that? I think it is priceless. 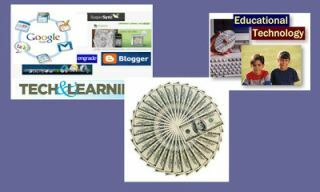 What do you think the value of educational technology is? Can we quantify it with numbers and data?